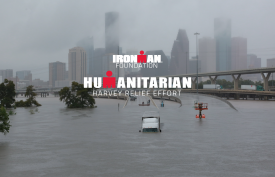 TAMPA, Fla. – The IRONMAN Foundation® announced today that it will award a $35,000 Humanitarian Relief Effort grant to Rebuilding Together Houston. The grant will help restore the homes of two seniors, Ms. Dorothy and Mr. Ronald, who live in Harris County and were impacted by Hurricane Harvey. The grant will also provide athletes with the opportunity to help restore their homes during a service project on April 26. Collectively, they will complete exterior work on Ms. Dorothy’s home and interior work on Mr. Ronald’s home. In addition, the IRONMAN Foundation will distribute $140,000 in charitable giveback to non-profit initiatives and groups in the greater Harris County and Montgomery County regions in conjunction with the 2018 Memorial Hermann IRONMAN® North American Championship Texas triathlon taking place on Saturday, April 28. Repairing homes and restoring hope, Rebuilding Together Houston impacts the lives of over a thousand Houstonians each year by providing free home repairs for low-income elderly, U.S. Military Veterans, and people with disabilities. We are a not-for-profit organization committed to the idea that all people deserve safe and healthy housing. Since 1982, we have reinvested more than $120 million in affordable housing throughout Houston and Harris County. In 2016 alone, our organization served 580 families, making it possible for family members to remain independent in their own homes. Through the work of volunteer groups and licensed contractors, and with the financial support of individual donors, local businesses and corporate partners, Rebuilding Together Houston improves the lives of our neighbors and revitalizes Houston communities, shaping a brighter future for our city and make it a better place to call home.